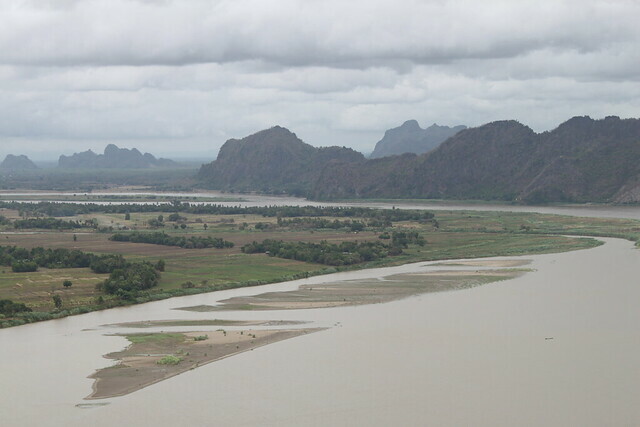 I was more excited crossing into Myanmar than I remembered being at a border for a long time. Perhaps because it’s the first country on this trip that I never planned on cycling in. I’d considered it as a distant possibility before I left but it seemed like too complicated a country to ride. There weren’t many borders open, foreigners’ movements were regulated, you were required to sleep in ‘official’ accommodation every night, police sounded like a nuisance and most importantly the southern area was very restricted. When I found out that a consulate for the country had opened in Chiang Mai last year I looked into it again. 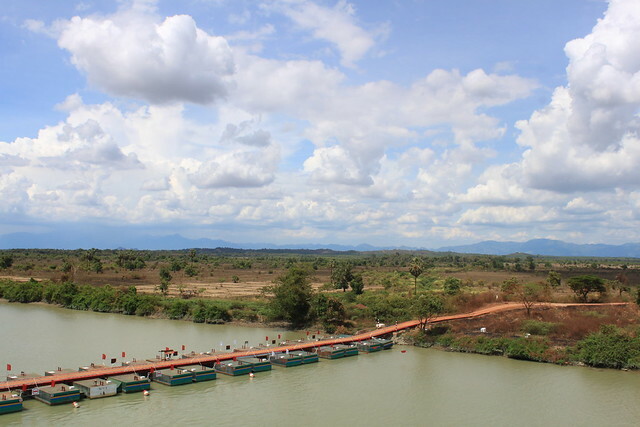 Not much had changed – but there were three crossings into Thailand where you could move between freely. The restrictions have eased a great deal but there were still sensitive areas down south. Every year they seemed to slacken a bit – before you could never go down there at all, then you could go to certain towns but only if you flew or took a boat and then it seemed you could get the bus. As for a bicycle? No one seemed to know. I found reports of people who had attempted it, but none had managed to make it all the way down. It seemed like a very bad idea, but also a very fun one. 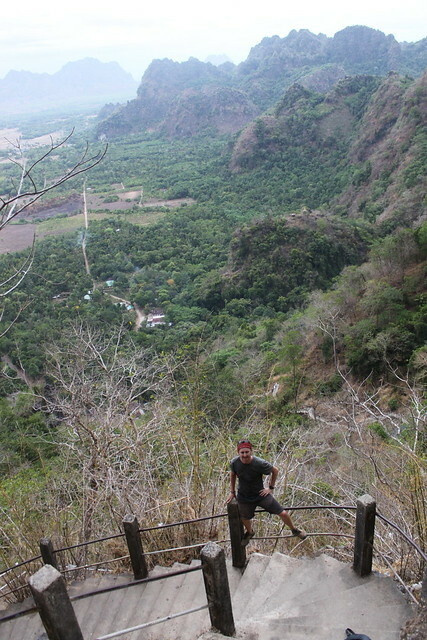 When I was last travelling in SE Asia back in 2011 the country had only just opened up really. No way would you have been able to get anywhere near where I wanted to now cycle, but there was still plenty in the country you could see back then. People were still talking about whether or not it was ‘ethical’ to visit a country with such a long list of recent human rights abuses but generally the opinion was that it would be a magical moment to create a relationship with the newly opened country. I didn’t feel like I had time on that occasion and I always regretted not visiting. So, now was my chance to make amends! It was a different world from Thailand. It was also the first ‘new country’ to me since Kazakhstan, which was perhaps also why the border was so dramatic. Curry pots lined the roadside diners with trays of samosas out, women walked with plates of mangoes balancing on their heads above their white thanaka (ground bark paste) painted faces while the men flashed blood red smiles from the betel nut pouches they chew and carefully re-wrapped their longyi (traditional dress) around their waists. It was a very different land. 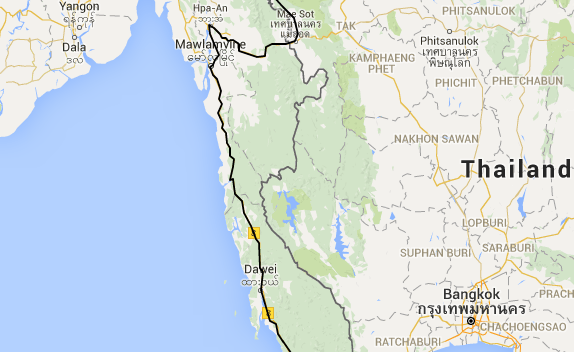 I casually flick between calling the country Burma and Myanmar. It’s most familiar to me as the former, but despite the extra syllable I’ll stick to the latter now for sake of continuity. The people I’ve asked here don’t seem to care and although Myanmar is more inclusive, it’s not like they chose the name democratically. 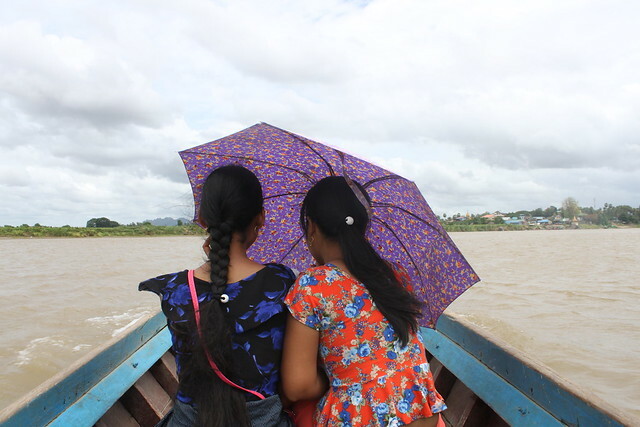 Not everyone in Myanmar is Burmese, but Burmese is the unifying language. It’s the same problem with words in many countries where not only ethnic group resides. I have never seen so many umbrellas. Protection from the rain and sunshine seems equally important. Not entirely sure why these girls had theirs up. For the wind? The difference in people was obvious from the get go. 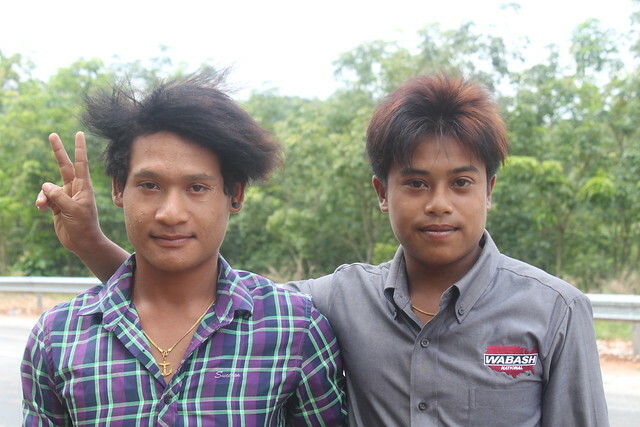 Some faces were light skinned like the Thais, but others were extremely dark – they looked like they were from way further west. 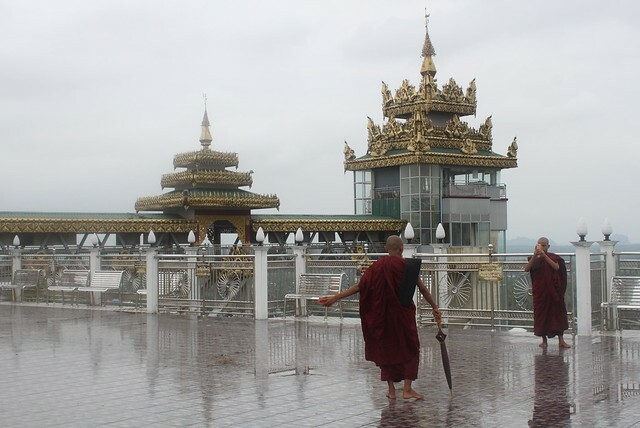 Myanmar has an intriguing mix of peoples and culture. You don’t have to dig far to see that all around. 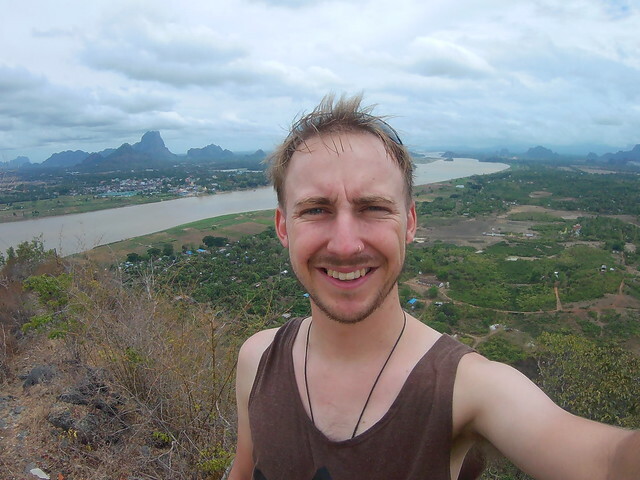 I cycled all the way to Hpa-An in a day, a long 145km ride. When I arrived it was already dark and the place was eery. They’re not particularly big fans of street lights in this country. In fact, electricity is a bit temperamental on the whole here. Power cuts happen all the time in the towns, smaller places have large chunks of the day without power and mains electricity doesn’t reach the rural places – small solar panels hang outside homes and the ‘fridges’ selling drinks are kept cool for the day with large chunks of ice that someone brings round on a motorbike cart now and then. I was exhausted and relieved when I finally found a bed. I’d heard so many stories about accommodation being extortionate in this country so I was happy to have found a spot for 5,000kyat (£3) where I based myself for a couple of days. The landscape was pancake flat. 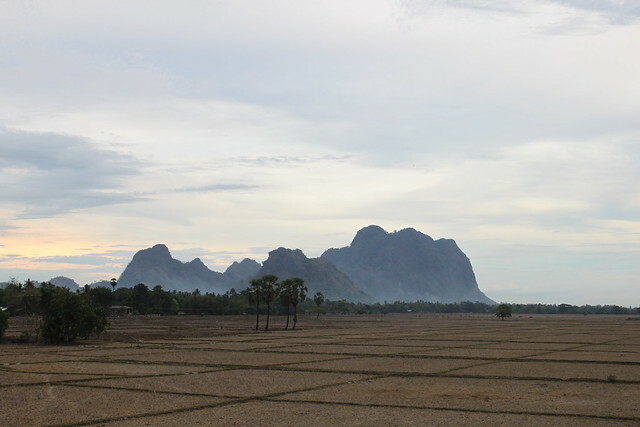 Bone dry rice fields stretched for miles, intersected by limestone cliffs that exploded out of nowhere. It was a surreal environment. 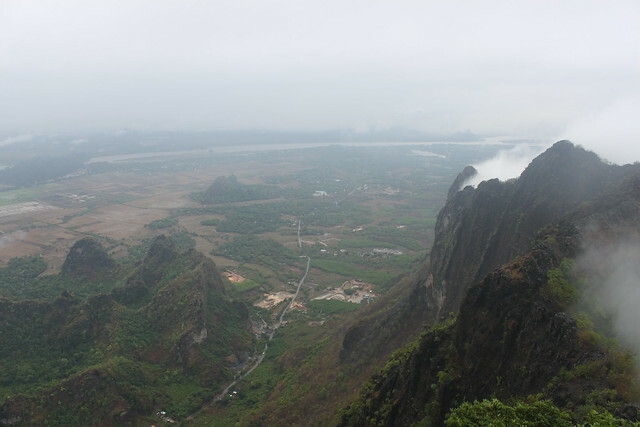 I headed over the river to hike up Hpan Pu Mountain. It was a short climb but a slightly terrifying one. 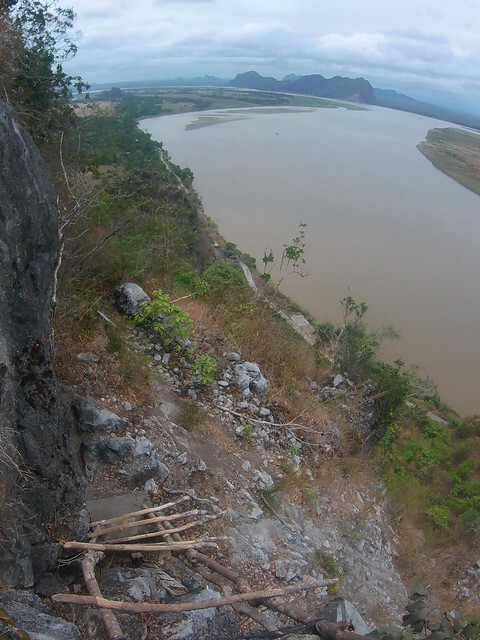 The makeshift ladders to the top were rotting away, meaning some nerve-wrecking scrambling was required. Potentially the tensest steps of my trip! I survived and the view was worth it! 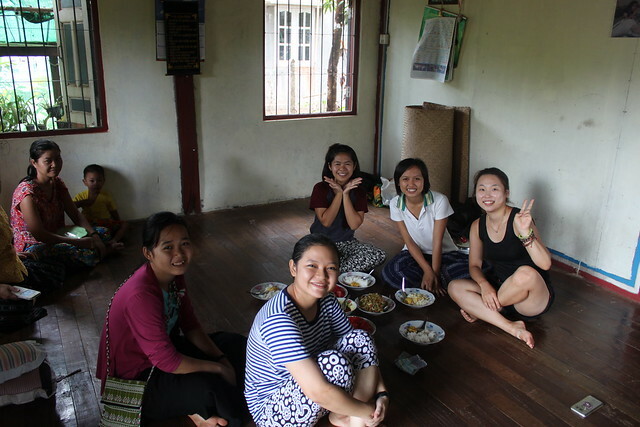 A friend I’d made in Mae Sot introduced me to a couple of local girls. Like most people here, they were Karen (although of different fractions, and their mother tongues not mutually-understandable). We had a delicious lunch at one of their mate’s house and along with another Korean backpacker, hitched a plan to climb up Mt Zwegabin. Foreigners hadn’t been allowed to sleep at the top before, but rules had recently changed so we could spend the night at the peak’s monastery. 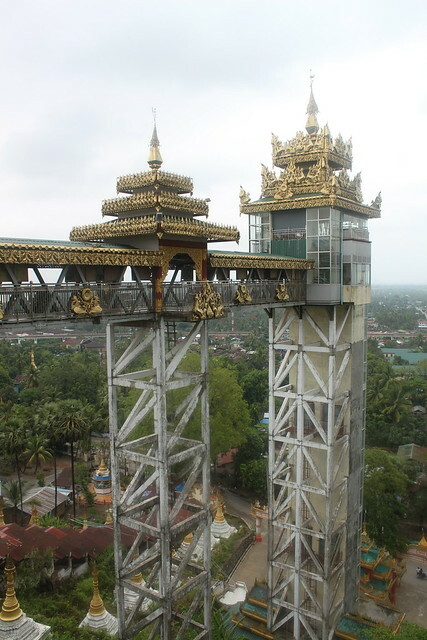 If I’ve learnt one thing about the Buddhists in this country, it’s that they love building places of worship in silly places. Rainy season finally arrived as we were hiking up to the top. Thanks Mother Nature – great timing. I thought that in monsoon season it just rained hard for an hour or two in the afternoon. It seems I thought wrong. It rained almost non-stop for the next four days. My night sleeping at the mountain top was cold and wet. The descent was cold and wet. 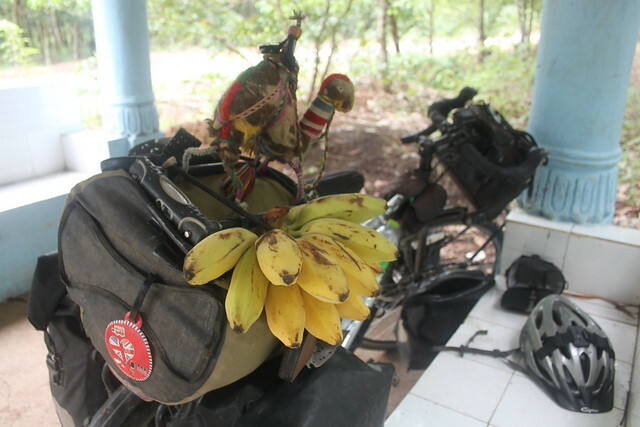 The cycle to Mawlamyine was also cold and wet. I was grateful for the sudden temperature drop, but I wondered how much patience I’d have with the elements if I had to live this damp for the next few weeks. Amazingly, I’ve barely had any rain for almost a year. In Turkey and Georgia last June my morale suffered in the daily downpours. But since then I’d only had to deal with the occasional rainy day. Sometimes months would pass with no rain and over winter it was so cold that any water just fell as snow (which is generally less of a nuisance than rain). I met an English girl in Chiang Mai who asked me where I was heading next. She said she’d never heard of Myanmar or Burma when I tried to tell her. I’m not quite that bad, but my historical knowledge of the country was pretty limited. I remember hearing about the 2008 cyclone and the government’s appalling attempt to deal with the disastrous aftermath, and I’ve read about the life of Aung San Suu Kyi – but certainly not to an extent that does her life’s campaigning any justice. 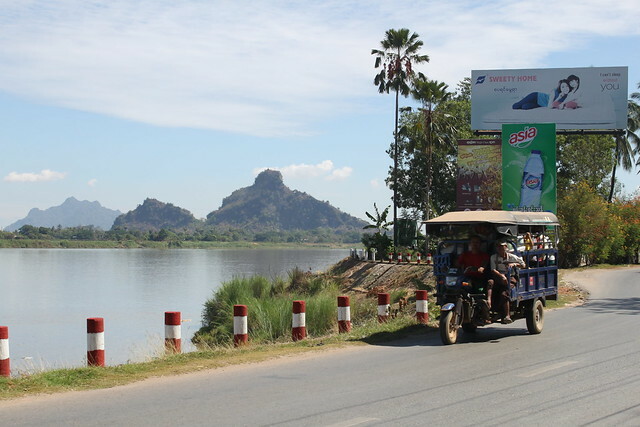 I had a lot of catching up to do, and what better a place to do some extra reading than in Mawlamyine – a town which acted as the capital of British Burma in the mid 19th Century. 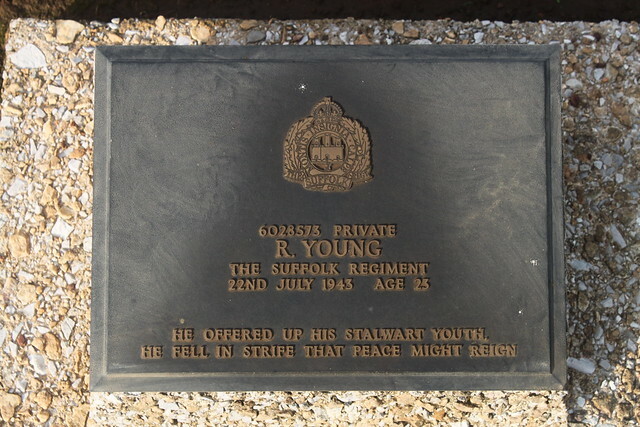 There doesn’t seem to be much trace of British rule in Myanmar. The snooker tables, the tea shops, the full size football pitches in the tiniest villages are perhaps the only noticeable leftovers. Hungry? Never a problem in Myanmar – there’s always food around. Even for the goats! 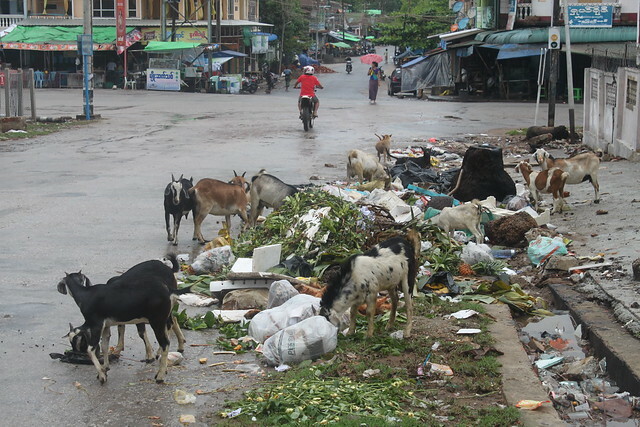 Mawlamyine was a messy town. A very wet town at that, too. I spent most of the day wrapping my (not-so-waterproof-anymore) panniers in duct tape. 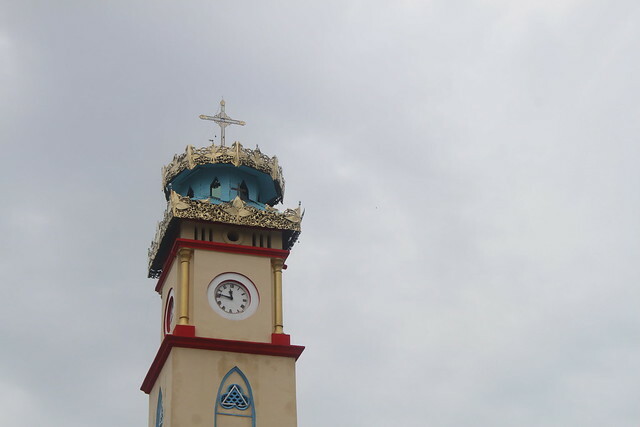 After the patching I could explore the street’s peculiar mix of colonial architecture and Burmese colour. 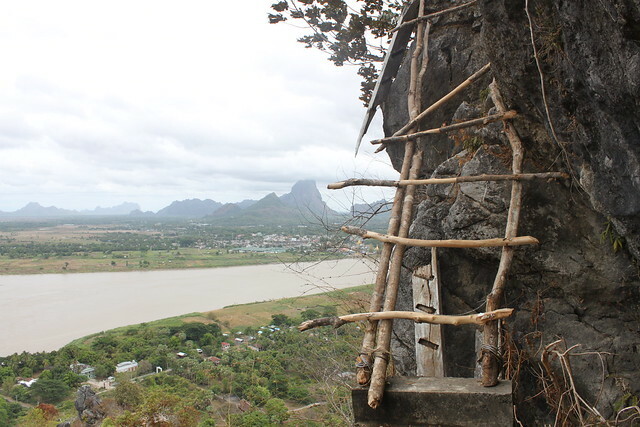 Most of the people here are Mon (it’s the capital of Mon state) but there are also plenty of Bamar, Indians and everyone else. 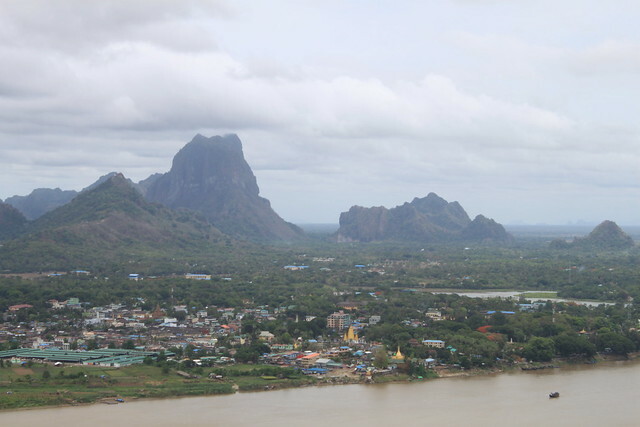 In towns like these I would see Churches (the Karen girls I hung out with in Hpa An were Baptist, but I also saw a couple of Catholic churches), mosques, wats and Hindu temples. I left town late, having waited hours for the rain to relent. It didn’t, and so I cut my day short at Pa Kauw Monastery looking for a place to sleep. 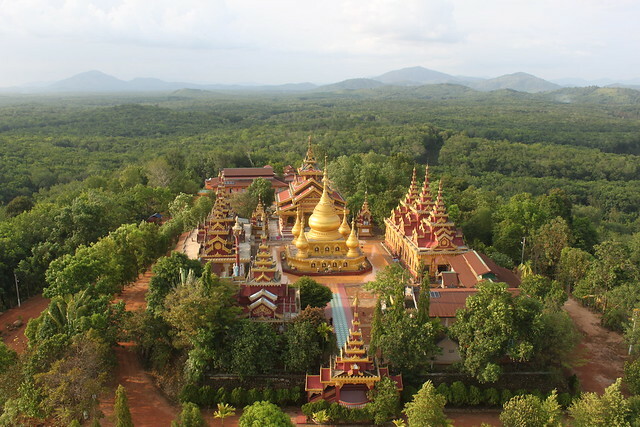 The monastery is home to a giant meditation centre – where anyone can go and try their hand at hard-core mind training. I pulled up at the registration office and asked if I could stay the night. A monk who looked like he’d never smiled in his life told me very explicitly ‘this not hotel. If you stay you must meditate’. I’d just come looking for a place to sleep, but if I was able to join in for an evening then I’d consider myself a lucky man. He then told me off for not being dressed appropriately, but before I had the chance to get out my wet shorts and vest he told me to cross my legs and get to work. For a few minutes he explained how I should approach the meditation, told me the house rules, got me to repeat some chants/prayers in a language I didn’t understand and then said: ‘OK – now we practise. 5 minutes meditation – go!’. And so I started meditating for the first time. I tried to concentrate but all I could think about was my poor bicycle outside in the pouring rain – I’d not had a chance to take it in under cover yet. No matter how often I cleaned my chain, it seemed permanently covered in a layer of rust in these conditions and had started slipping from wear. 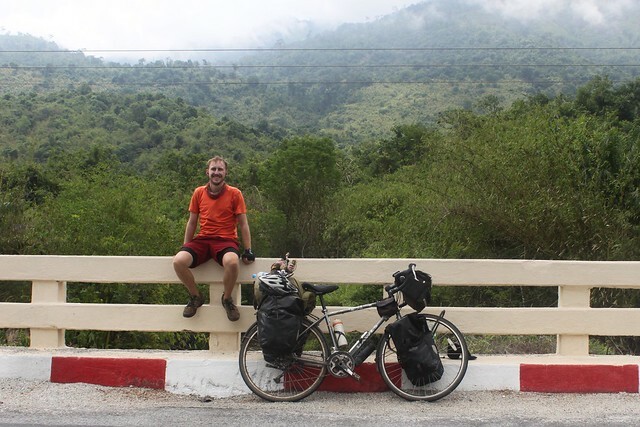 I felt like an idiot for not changing it in Thailand because had I done that, now I’d surely be meditating ‘in the zone’ like a true Buddhist master rather than feeling sorry for my bicycle. Picture the scene. This old monk and I sitting side by side in large empty room, cross legged on the wooden floor. God knows how long we’ve been sat there – you loose track of time when you’re meditating. I tried to peek at my watch but it was too dark to read the numbers. I guessed at least an hour but it was probably less than 30 minutes. Suddenly the monk passes wind. Not just any old fart, but one of those screamers that hangs like a fragmented melody as it squeezed out from under his arse and vibrated along the floorboards. I bit my lip hard. The moment was so surreal I almost burst into immature laughter. But, I held on. Then a couple of minutes later he did it again. This time it positively whistled out, dropped in pitch and then rode like a whole melody of its own. I’m not sure I’ve ever heard such a long fart in my life and it took me to the edge. This time I had to bite my lip until it hurt. At tear of silent laughter trickled down my cheek and I prayed that he wouldn’t open his eyes and see my face contorted in suppressed hysterics. Perhaps you remember the story from about a year ago, when I was invited to attend Friday prayer at a small village mosque in Turkey. The guy I was with had been kindly translating the imam’s preaching, but suddenly decided to ad-lib and whispered sarcastically ‘and now he says ‘go to Syria and fight with your brothers!’‘ and I nearly burst out laughing in the middle of the service – amazed he’d such an outrageous joke in such an inappropriate moment. Both times I’d held it together. After my meditation session I ate a sneaky samosa in the toilet and made myself comfortable on the floor of the monk’s room for my night’s sleep. We awoke at 3.30am with the ringing bells and began meditating at 4am for another 90 minutes. It was easier this time – I was rested, relaxed and past the point of hunger. Meditation is hard. Clearing the mind and concentrating on one point without distraction is hard – the mind has a natural tendency to wander. Occasionally I found myself really ‘in the zone’ – my head felt empty and yet focused. Then suddenly my head would wobble uncontrollably and I’d nod back into position. I wasn’t ‘in the zone’ at all, I was just falling asleep. When I opened my eyes the morning light had finally arrived. We walked to the food hall surrounded by hundreds of silent monks, strolling in single file holding beige umbrellas above their saffron robes. 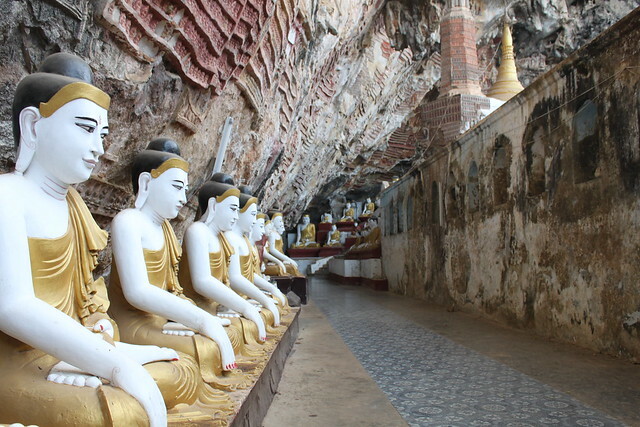 The monks weren’t just from Myanmar – they were from abroad too. In the meditation class I attended later there was one monk from China and one from Singapore. 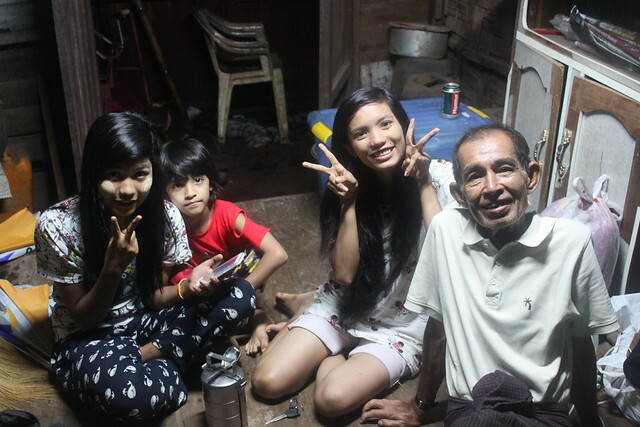 I met a family from Vietnam too. There was a handful of Westerners living there too: I met one English guy when I arrived who’d been there for months. He was clearly impressed at how far I’d cycled on my trip, but not nearly as impressed as I was that he’d sat meditating for 9 hours every day for so long. 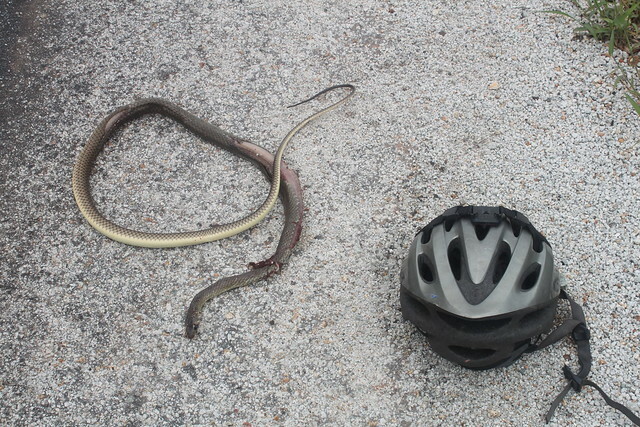 Starting to see a lot more snakes on the road. At least most of them are dead! It still hadn’t stopped raining so I stayed for one more session. This time I was allowed to head up to the main meditation hall with everyone and there, for the first time, I felt like I began to control my mind for most of the 90 minutes. At lunch I finally left – with plenty to think about in the pouring rain. I was very lucky to have had the opportunity to stay in the meditation retreat. I realised a lot, but nothing that I hoped to discover. I’d been very interested in attending a Vipassana centre in South East Asia, but now that I had had a taste I suddenly wasn’t so keen. I am interested in the art of meditation – I believe it’s a powerful tool to strengthen the mind, and although I am interested in Buddhism as I am in any religion, I do not want to be a Buddhist. At Pa Kauw monastery everything was done (I assume like most of the centres around here) within a Buddhist framework. 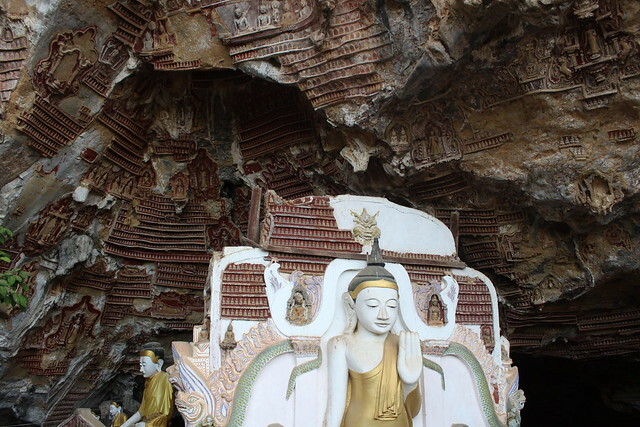 I was told to repeat religious prayers and to pray to the statue of Buddha. I felt like a fraud doing so – kneeling down to the floor to pay homage to a gold statue seemed both degrading to the religion (when I clearly don’t believe in it) and to myself (why should I bow to a statue?). I’m not sure why Buddhism is often held in a different regard to the other major religions of the world in the west. There are many aspects of it that are appealing and logical, but also a load of washed up in nonsense. Buddhists believe as many crazy things as any other religion and there are plenty of areas where faith and life becomes an uncomfortable balance in this country (I’ll get on to that later). I have a great amount of respect for these monks. To meditate so many hours everyday for so many years is quite extraordinary. I wouldn’t want to do it myself (I believe the amount I experience in 8 hours cycling is far greater than what I could gain from 8 hours meditating), but clearly they are impossible comparisons and it doesn’t detract from how impressive I find it. Yes, I am interested in meditating more and hope to do so when I find the time and oppurtunity. No, I do not want to pretend to be a Buddhist and meditate in a religious context. Good thing I have the wide angle lens to squeeze this giant into one photo! 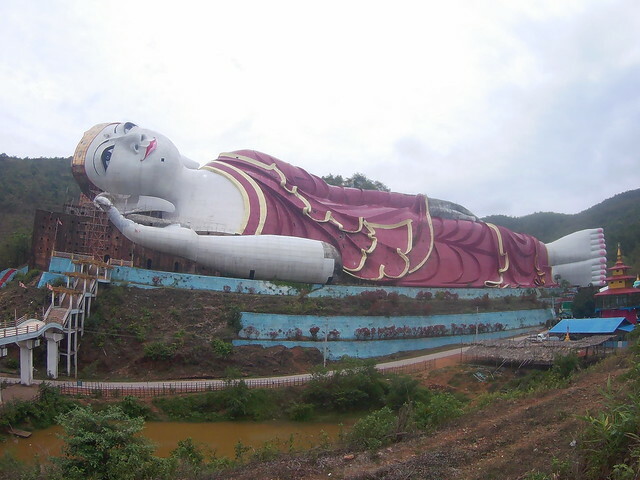 Just a little south of the monastery was a 170 meter long reclining Buddha statue. It was simply ginormous. 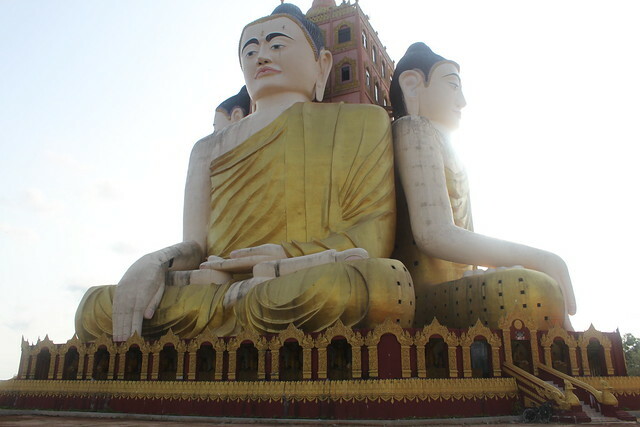 Then, just a little further south I passed another huge meditating Buddha statue. This one, it seemed, wasn’t even worthy of a mention in the guidebooks. Clearly there’s no shortage of ‘sights’ in this country. A guy in a van stopped to say hello to me on an empty stretch of road through rolling rubber plantations. He got out and greeted me with a ‘how’s it going?’. You can usually tell pretty quickly if someone has an unusually good grasp of the English language, especially if they meet you with a line that you don’t get from the textbooks. 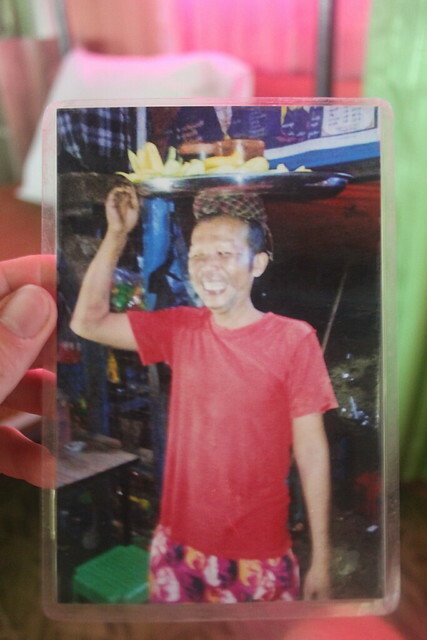 He’d been working in Ohio for a decade, and was back to Myanmar to visit his family. In the past, he told me, this road would have been very dangerous to travel. At the time he left there was a lot of fighting between the Karen and Mon in the area. He said he would have never got out to the car to talk to me, as he’d probably get robbed at gunpoint by bandits. But then again, someone like me would never be cycling this road… I wouldn’t have had any trouble with the Mon, but probably would have with the Karen (although he was Mon, so he probably would say that). I ended the day in Thanbyuzayat. I’d snapped a spoke and wanted to search for a bike shop with a spoke wrench and cassette remove. 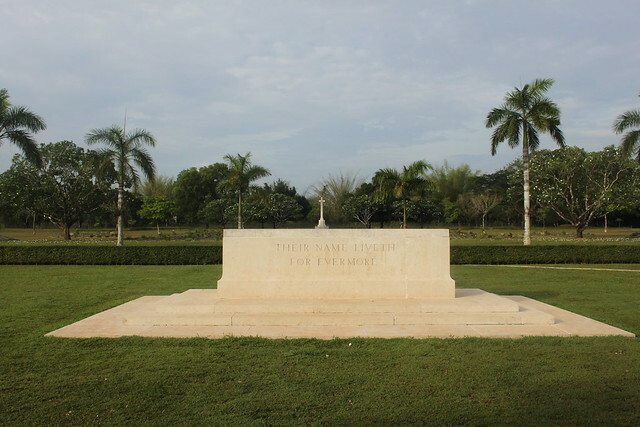 I had no luck – but it did mean that I had time to visit the Thanbyuzayat War Cemetary, a memorial to the Allied POW’s who died building the Burma-Sian ‘Death Railway’ for the Japanese. 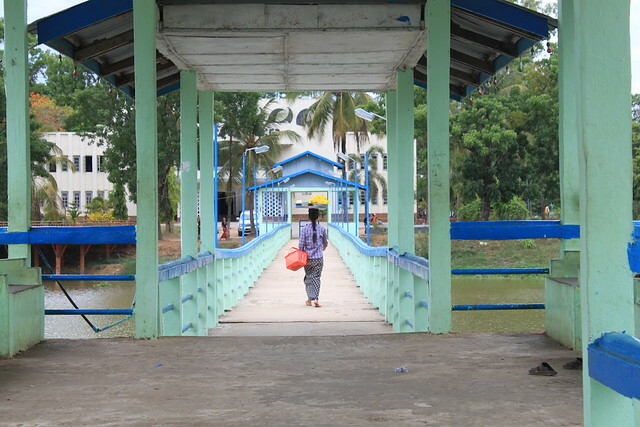 Amongst all the clutter and chaos that makes up Myanmar, the cemetery was a haven of peace. Everything was neatly presented: 3771 gravestones and neat flower beds laid out orderly on freshly cut grass marking the western end of the railway. On the way out I noticed a sign that read: ‘Funded by the Commonwealth War Graves Commission’. That explained things. 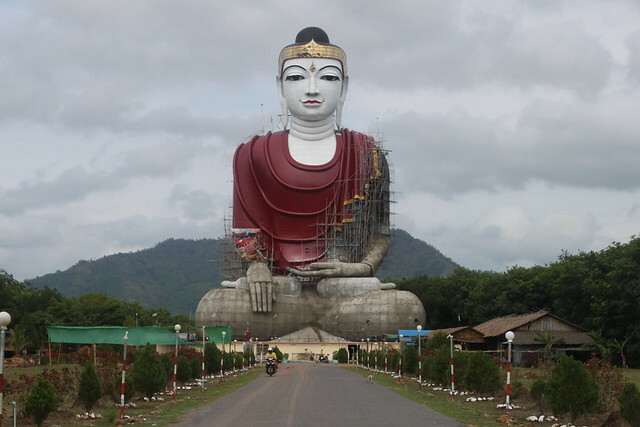 The next day I passed yet another giant Buddha statue, just off the road before Ye. This one was a four-sided monster and you cold walk up the 9 floor interior to the very top. As I stood on the roof looking out across yet another massive reclining statue under construction, I couldn’t help but be startled how unbalanced the lives of the ordinary people here are compared to the glossy golden icons built in the name of religion. This follows on from my earlier point about Buddhism here. Below you could see the simple roofs of the houses in the nearby villages I’d just cycled through. 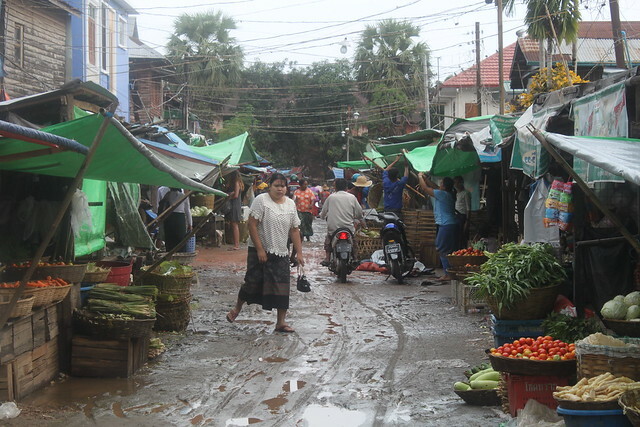 Many of the people around here are extremely poor and live in incredibly basic conditions. If they look up through the trees they can see this mighty nine-floor statue covered in gold that probably cost enough to turn their whole village into strong, clean brick homes instead of wobbly bamboo huts. I hope they have stronger faith than me – otherwise it would be a real slap in the face. Of course, I’ve passed many places in the world where an obscene amount of money goes to religion – but it never really made a big impression on me until this moment. In Europe there a fancy churches that would have had the same imposing presence on the surrounding community but now they are dwarfed by the skyscrapers of the business world. 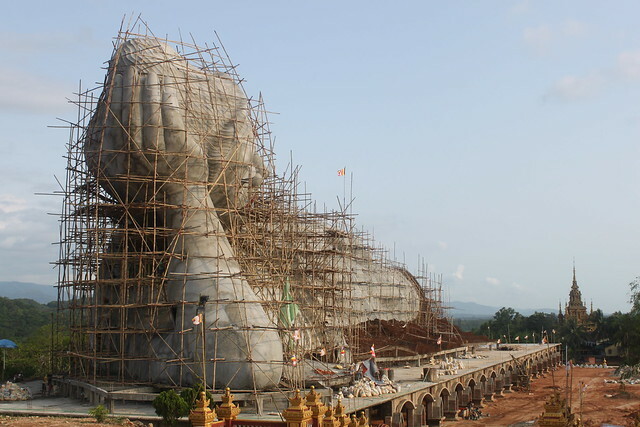 The reclining statue under construction. Again, spot the tiny workers at the bottom for size perspective! I found a dirt cheap room in Ye so stopped for a couple of nights. I love this country – especially the people here – but sometimes the attention is exhausting. In the morning I made all kinds of excuses not to go out: washing, cleaning, sewing etc. I just couldn’t handle the stares outside. I haven’t had that feeling for months – definitely not since China. Eventually I went out hunting for a bike shop. My rear wheel was wobbling badly and really wanted my extra spoke in. I did find a bicycle mechanic (people here cycle a lot), but he didn’t have any of the tools I needed. They looked at my bicycle like it was a spaceship – they’d clearly never seen anything like it. As embarrassing as it is to admit, that bike is probably worth as much money as his entire shop. The first evening I went out to make some friends. Not very hard in this country, especially if you find the local water hole. I found a spot for a beer and was invited over by a bunch of hammered local guys drinking rum diluted with water (seems to be a popular mix in this country). They were an entertaining bunch, as drunk people often are and I was inundated with gifts: a bag of mangoes and a chilli fish paste to dip the fruit in (yuck! 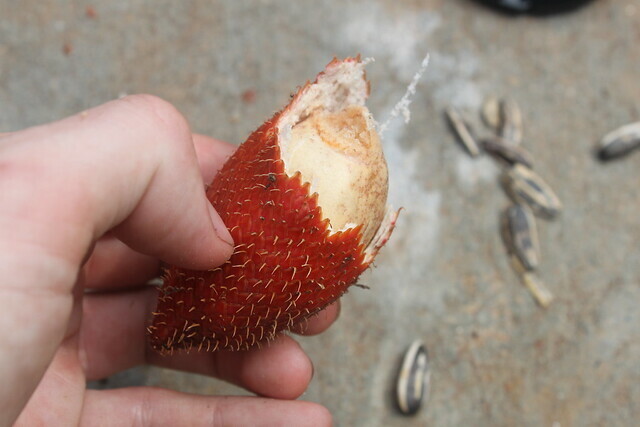 ), some other mystery fruit, some tea leaf salad, bags of nuts and the strangest present – a photo of one of the guys walking around with a tray of mangoes on his head, plucked from the wall. After a few rums, agreeing to take it back to England seemed an easy promise, so now I’m carrying the strangest photo ever in my bag. I posed for lots of photos holding a huge National League for Democracy flag and gave lots of thumbs up for England & Myanmar together. My country is as popular here as anywhere else, even as ex-colonists. Aung San Suu Kyi is probably the reason for that – they adore her here. The next day I walked past the same shop/bar and saw my new pals looking a little more contained. They complained they had no money for rum so I offered to buy them a bottle (a bottle is insanely cheap – less than 50p) but an old bloke whisked me away to his house for dinner. Here you can spot the girls’ thenaka face paint. Everyone (male and female) in the country walks around with this stuff smeared on their faces. 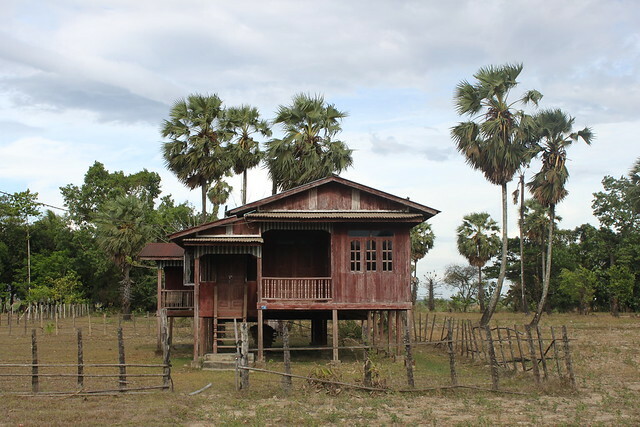 His home was an incredibly basic wooden hut that looked like it would fall apart if I so much as to jumped inside. I’ve been invited into plenty of basic homes on my travels, but none this simple in the centre of an actual town. He went off to buy me dinner and returned with his granddaughters, eager to see the the foreigner. It was a lovely evening and once again I found myself wishing I had the words to thank a stranger for making me feel so welcome on the other side of the world. I hope the smiles were sufficient. How many bananas = too many bananas? Turns out I was in for some luck. 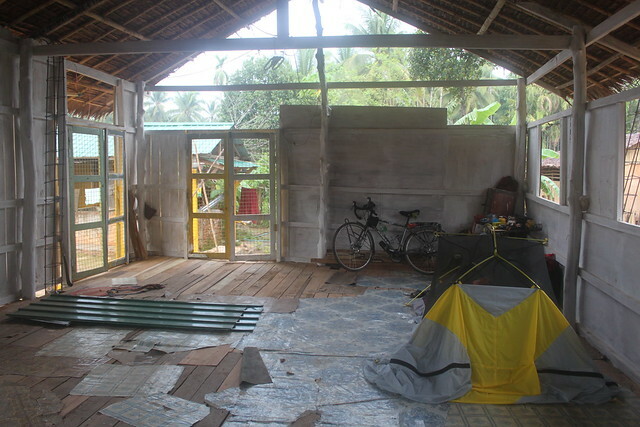 In Dawei I finally found a half decent bike mechanic and could switch my spokes. I tried to true the wheel as best I could, and despite the fact that the rim is pretty buggered it was a lot more comfortable to ride. In Dawei I also found working WiFi for the first time in the country which meant I could (sort of) stream AFC Wimbledon’s victory in the play offs. I went to sleep a happy man. 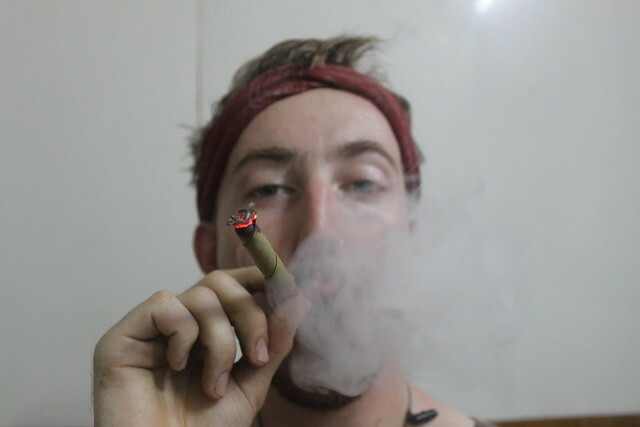 Myanmar was treating me incredibly well, but the tough part was still to come.